It’s Christmas time at our dojo and this ninja is providing the festive music and doing his physical computing coding at the same time on his Raspberry Pi. In Ireland we do not have a “ready steady” amber light. We have just a warning to get ready to stop. This is an Northern Ireland traffic lights sequence. We decided to to have EU Code Week in our dojo this week. Our mentor brought some new ideas back from MegaDojo 2018 in Maynooth last Saturday. 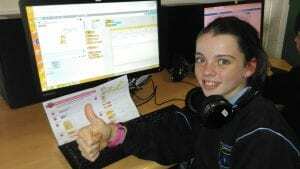 We put otheBBC micro:bits we received from DoderDojo HQ to the test. We checked out all the built-in sensors and carried out a few simple tasks using a tiny bit of code. A few simple lines of code and we could get the micro:bit to read the room temperature and light level. The light reading changed to 248 at the door and 93 under the workststion. The temperature dropped by 3 degrees at the door. It was great fun! Did you know you can make a simple FitBit with a BBC micro:bit? Everybody likes to use the mentor’s work station. It all appears on the big screen. It is great when a little tweak changes everything. The microSD card on my Raspberry Pi 3 got damaged on Open Day last May. So I had to set it up all over again. The first time was very exciting but this time it was really boring. It took up most of the dojo time and I almost started my homework but I was afraid I might have to press a button or something so I waited. The Raspberry Pi makers should make it play music or have a game on the screen for you to play while you are waiting. It was all worth it when it finished. I hope it gets more exciting than this stuff. Installing NOOBS takes a long long time. NOOBS means New Out Of Box Software. Our mentor had it downloaded for us but he showed us how to get on the Raspberry Pi Foundation website https://www.raspberrypi.org/downloads/noobs/ Make sure you pick the full version and not the LITE one. First of all I had to format the microSD card in the card reader. To do that I had to use a SD card adapter card to make it fit in the slot. You have to use a special app called SD card Formatter https://www.sdcard.org/downloads/formatter_4 to make sure it works. It was very noisy at the dojo today. Everyone was excited because we tried something new. It turned into a race with some groups but they made lots of mistakes. My group took our time. Interesting! So far, so good. Don’t forget the end bracket. 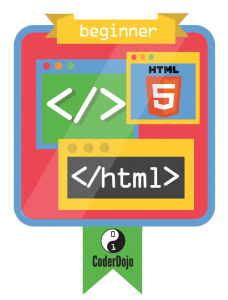 It is European Code Week 2018 and some of us in the dojo are going to try to move from Scratch to Python. First we had to download MU from the internet. MU is a really simple Python editor for beginner coders. The Raspberry Pi group go about things slightly different but it works the same. Our mentor handed gave each group a cheat sheet to make things a bit easier. The biggest delay was the MU download because everyone was doing it at the same time. Our mentor said he will have MU on a USB key for the next dojo. Python is very tricky because if you forget to hold down the SHIFT key you get a ; instead of : and then you get an error. My coding buddy spotted the mistake. Typing in text for Python is very sloooooow. Scratch is fast! If you want to buy or borrow a book during the summer holidays check out any of the above titles. They cost less than a take away meal. 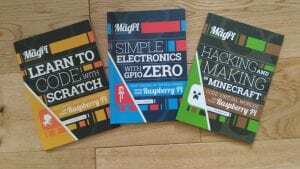 Alternatively, the PDF file can be downloaded free of charge at https://www.raspberrypi.org/magpi/issues/ The full list of all the MagPi Magazine editions and the “Essential” publications are available at this location. I visited the computer room today and downloaded all the ninja directories so the coding award badges will be emailed over the next few days. If you saved your work to your MegaDojo USB band leave a comment using your username. Do not use your real name. I will email your parent / guardian. It was Open Day at Saint Attracta’s Senior National School today. 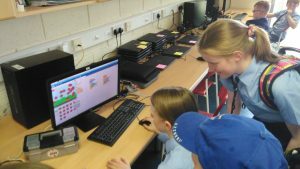 All the ninjas at SASNS dojo introduced parents and future pupils of the school to the newly arrived BBC micro:bit. 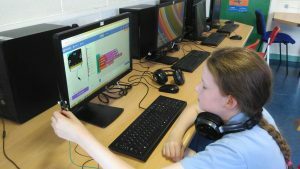 Scratch and Minecraft were also put through their paces. Most of our demos worked! The Theremin wasn’t as musical as we thought but it worked first time. The girls showed the visitors around and demonstrated various activities. Here Scratch is being shown on a Raspberry Pi 3. The boys also worked hard in the background showing off the 8 Ball and Coin Flipper on the microbit. 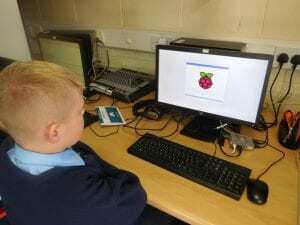 Raspberry Pi and microbit working side by side. What do you think of our new badges? It was great timing! 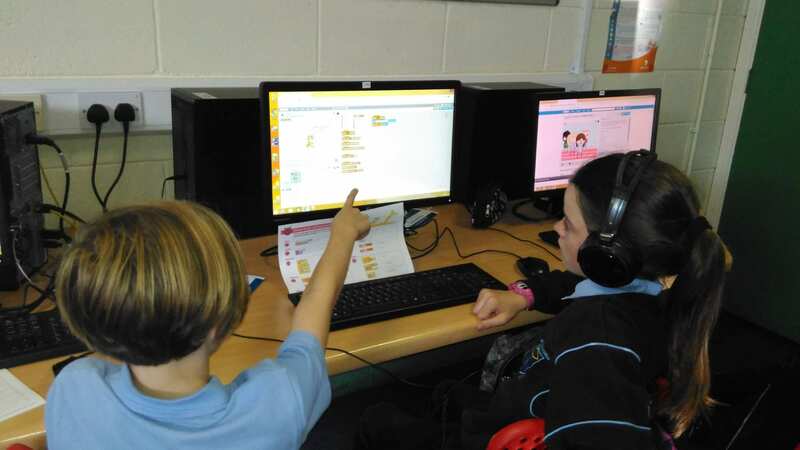 Our dojo Starter Pack arrived just in time and we put what we had learned on borrowed BBC micro:bits into practice using our new kit. Wow! A club kit of 10 BBC micro:bits was a great surprise. Lots of other goodies arrived including our badges but we were too busy to check it all out so that is a post for another day.